After reviewing Freakonomics last October, Derek tipped me to another book in that genre that I might enjoy. 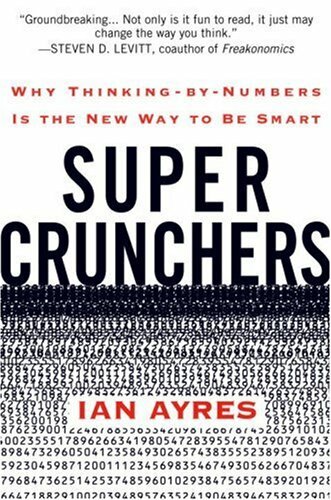 Super Crunchers: Why Thinking-by-Numbers Is the New Way to Be Smart by Ian Ayres was a better book than Freakonomics in my opinion. Super Crunchers was less about the answer derived from data analysis, it was more about constructing the question. This to me was more interesting. Having read this after The Black Swan was fortunate for me. In that book the lesson was we as humans are horrific at making predictions, because of various fallacies and biases. Super Crunchers goes into how vastly expanding the data set and asking the right questions can produce better predictions than making professional judgments on any one piece of data. I’m glad you liked it! It left me thinking about how this regression analysis is done. And what other interesting bits of data are out there just waiting to be mined to turn conventional thinking upside down? I’d like to see if there exists a connection between driver accidents and the number of minutes on a cellular plan.